(MENAFN - Daily Outlook Afghanistan) Over the past year, the treasures of the Afghan National Museum were on exhibition in major cities in China. The visitors for the exhibition were crowded and the event was unprecedented. People were shocked and impressed by the glorious civilization of ancient Afghanistan. The time span of these cultural relics was from the 2nd century BC to the 12th century AD. According to archaeological discoveries and Chinese ancient books, Afghanistan was the center of commodity distribution in the Eurasian continent at that period, during which the Afghan people were rich, well-organized and relatively peaceful. So when the Chinese envoy Zhang Qiang invited the then Afghan king to jointly fight against their common rivals, the Afghan side said they had no intention of fighting anymore and would like to enjoy their peaceful lives. Over more than 1,500 years since the 1st century AD, Afghanistan had been the pearl of the ancient Silk Road. Many historians pointed out that the fate of Afghanistan and many Asian countries were closely related to the rise and fall of the Silk Road. This is also supported by economic theory. The British philosopher Francis Bacon has a famous saying 'There be three things which make a nation great and prosperous: a fertile soil, busy workshops, easy conveyance for men and goods from place to place. He pointed out three major elements of a country's economic surge: agriculture, industry and transportation. A strong and stable country cannot live without its own agriculture as foundation. The rice bowl must be firmly held in its own hands. The farmers must be rich and have extra grain for sale. The spared labor could make living in other ways. This is the primary source of capitals and manpower needed for urban economic and industrialization. Both Afghanistan and China were agricultural powers in their early stage, and our agricultural tools and irrigation system were the most advanced across the world. The main products China exported to Afghanistan were silk and tea. The most important products China imported from Afghanistan and Central Asian countries were war horse. These commodities were all agricultural and livestock products. The state organized water projects, supported farming, protected the small peasant economy, and regulated food prices to balance the interests of farmers and urban strata. Such national governance was always strong and delicate. Without agriculture, there would be no political stability of the big powers. Without sustainable trade, there will be no Silk Road and the prosperity of countries along the Silk Road. Talking to the industry. There is a Chinese proverb, 'Without industry, you could not be rich. In not only the ancient but also the present Silk Road, the best-selling and most profitable commodities were often not the agricultural products and raw materials, but fine processed products and industrial products. In ancient times, it was Chinese silk, porcelain and Afghan glaze. At present, it's mobile phones and airplanes. The price for one iPhone 7 smart phone is $650, equivalent to an Afghan farmer's annual income. The Chinese makes only $8.46 by assembling the phone. Japan and South Korea get $68 and $17 each through specialized materials and designs. About $283 goes directly into Apple's pocket because of their monopolized patents, technology and sales channels. This is the harsh reality of modern industry and its benefit distribution. A Boeing plane costs an average of 100 million U.S. dollars, equivalent to 120 thousand Afghan farmers' annual income, equivalent to 10 million shirts made by the Chinese. This is what President Ghani called the 'scissors gap caused by the 'position gap in the global value chain. Finally, Let's talk about transportation. Generally speaking, if agricultural products are carried by people and livestock, as long as the distance exceeds 100 kilometers, the transportation cost will often exceed its own value, and the products will not be competitive. The land transportation of the ancient Silk Road mainly relied on camels and horses. A camel could carry 200 kilograms of goods to 1000 miles away, but its own and human consumption often surpasses the half value of the goods. Shipping is different. A 1000-ton sailing boat can carry as much as 5000 camels at a cost of only a dozen dollars per ton. This is also an important background for the fading of silk roads on land after The Age of European Navigation. Even today, the disadvantage of land transportation is obvious compared with that of sea transportation. The distance from Kabul to Urumqi is 3000 kilometer away, but the transport of a standard container requiring Road + Rail transportation, which costs a total of 7100 U.S. dollars, while a container shipped from Karachi to Tianjin, with a distance of thousands of miles away, costs only 1000 U.S. dollars. But if the container was transported to China from Kabul via Karachi, the total cost will increase to 6000 U.S. Dollars, with the land transportation costs and transfer costs in Karachi included. A container costs will be more than 10 thousand U.S. Dollars, if you add the 6000 to 7000 U.S. Dollars transportation fee to an average tax of 3000 U.S. dollars depending on the type of goods. This will exceed the value of many goods, which is the main reason for why many Afghan specialties cannot be exported and competes with other countries and leave the farmers live in poverty. It should also be noted, although it was very difficult for Marco Polo to travel from Venice through Afghanistan to China, but at that time the whole silk route was ruled by the Mongolian empire, the businessmen can travel without passports and visas, or too much tax, and were even provided with food, accommodation and security. So Marco Polo's team is profitable. Since modern times, the costs for customs clearance, transition and security among European and Asian counties have remained high, which has greatly affected the Afghan economy. Afghanistan is a landlocked country without sea ports. From the perspective of factor endowment and economic development stage, if Afghanistan cannot develop its advanced manufacturing and financial industries as Switzerland and Luxembourg, nor has enough residence deposit or foreign investment, it must accumulate capitals from its own agriculture, mining, handicrafts, tourism and transit trade, and gradually realize its industrialization and modernization. This is why it is important, imperative and urgent for Afghanistan to participate in regional economic cooperation. The glory of Afghanistan in the ancient Silk Road relies on its own distinctive products, national peace, adherence to openness, promoting the connectivity and good relations with its neighbors. Afghanistan can get illusion from the history. I believe, Afghanistan's efforts in advocating RECCA, participating in CAREC and SAAC, promoting CASA-1000, and TAPI, Lapis Lazuli Corridor and Air Corridor, are all based the on past achievements and lessons, and reflects the ancient Silk Road Spirit of opening up to the future, commitment of shaping comparative advantages, smooth flow of trade and reduction of transportation costs. Today, there is an initiative or mechanism that can help Afghanistan achieve the goal of fully participating in regional economic cooperation, develop its country from landlocked into land-linked and from the economic lowland to highland, promote its agriculture, industry and trade. This is the BRI. Early this year, Dr. Mariam Safi, founder and executive director of Afghan think-tank DROPS, published her research report Integrating Afghanistan into the BRI: Review, Analysis and Prospects. It is the first report by an Afghan scholar that systematically focuses on the BRI. 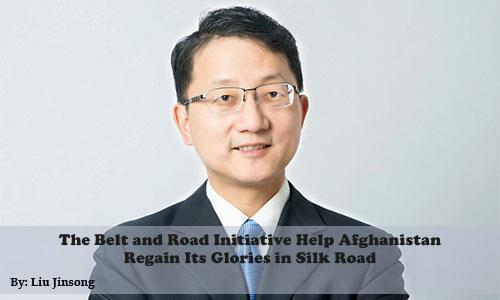 Dr. Safi said that Afghan people from all walks of life appreciated the China's invitation to jointly build the BRI. While the Afghan situation is still not peaceful, the move gave Afghanistan a ‘cardio tonic'. It is aligned with the fundamental interests of Afghanistan and its people and will be conducive to Afghanistan's fully tapping its development potentials and regain the glories as the Heart of Asia, Eurasian crossroads and a trade hub along the Silk Road. The BRI is a general term of Silk Road Economic Belt and 21st-Century Maritime Silk Road, which were announced by Chinese President Xi Jinping during his respective visits to Kazakhstan and Indonesia in 2013. The BRI also got the support from H.E. President Ghani and all folks of Afghan people. Presently, it is the warmest project for people's well-being, the largest blue print for infrastructure, the best development plan and the most sincere idea for international cooperation in the world. '1: Jointly build one community of shared future. The community is different from European Union which is characterized by transfer of sovereignty and high-level institutionalization, but is based on respect for sovereignty of countries, uphold the principles of openness, equality and a step-by-step approach, and accommodate each others' comfort level, in order to achieve regional integration, lasting peace and development. '2: Take Asian and European continents and their adjacent seas as the core, land and sea as the two wings, and plug two wings for the Asia 'Garuda. '3: Uphold the principle of achieving shared growth through discussion and collaboration, achieve the objective of High Quality, High Standard and High Level. The BRI was proposed but not led by China. The relationship of its participants is equal development partnership rather than donor and recipient. It is totally different from the Marshall Plan in nature. '5: To promote policy coordination, infrastructure connectivity, unimpeded trade, financial integration and people-to-people bonds are the five major goals of the BRI. '6: The BRI will focus on developing six economic corridors and six pathways. Six economic corridors include China-Central Asia-West Asia, new Eurasian Land Bridge, China-Mongolia-Russia, China-Indochina Peninsula, China-Pakistan, and Bangladesh-China-India-Myanmar economic corridors. Six pathways means railway, highway, waterway, airway, pipeline, and information express way. '7: The BRI mainly covers 7 plates: Northeast Asia, Southeast Asia, South Asia, Central Asia, West Asia and North Africa, Russia and Europe, other areas. The BRI is open to all sharing similar goals. It mainly focuses on the Eurasian continent, yet is not limited to the area of the ancient Silk Road and Eurasian countries. '8: Facilities connectivity, industrialization, exploration of energy sources, economic and trade cooperation, financial cooperation, cultural exchanges, eco-environment protection and maritime cooperation are 8 priority areas for implementing the BRI. Why does China initiate the BRI? There are various speculations outside. Some say that this is China's geopolitical strategy to counter US 'Asia-Pacific re-balance strategy or 'Indo-Pacific strategy and promote its excessive capacity. In fact, all those concerns are unnecessary. The BRI is neither a 'Trap, nor a 'Tip or 'Tactics. It's a 'Team work and also indeed a 'Test to the major-country diplomacy with Chinese characteristics. First, in order to realize more balanced, comprehensive and higher-quality development, China needs to develop its west, give full play to the advantages of West, change the situation that economic development heavily relies on the performance of eastern coastal cities, and promote land and marine development in a coordinated way and all-round opening up. Second, under the backdrop of sluggish world economy and trade, and increased economic pressure in Asia, many research institutions have lowered their growth forecasts since the beginning of this year. At this time, it particularly requires effective investment, infrastructure financing, and supply-side reforms to stimulate economic growth. Third, the 'economic sunken situation in the Asia inland and the hinterland of Central Asia should be changed. As we can see from the satellite photo taken at night, the brightly-lit places, that is the economically developed cities, are mostly located in the coastal areas of Eurasia, which is subject to both economic rules and colonialism. Now we should work to make every corners of Eurasia developed and Central Asia become the new growth engine. The international economic authority had a data analysis indicating that the center of the world economy was near Afghanistan around AD 1600, thereafter gradually shifted westward to the Atlantic Ocean, and turned back to the east around 1950 when People's Republic of China was founded and King Zahir Shah was in power, is now accelerating the shift to the east and approaching Afghanistan soon. 'Chance favors only the prepared mind, I hope, we can jointly grasp this historical trend. Fourth, the world now really needs multilateralism, free trade, and great power responsibilities，as well as direction, confidence, and certainty. It's really necessary to eliminate terrorism and extremism from the source. That is a lasting and dignified peace, reducing poverty and increasing employment. These are urgent needs of Afghanistan, and it is precisely the initial intention of the BRI. In the past five years since the launch of the BRI, the volume of trade in goods between China and the relevant countries has exceeded 5 trillion US dollars, with an annual growth rate of 1.1% against the backdrop of world trade decline and negative growth. Chinese direct investments in those countries have exceeded 70 billion dollars, with an annual growth of 7.2%. The 82 economic and trade cooperation zones, constructed by China all over the world, have paid over 2 billion US dollars in taxes and fees to the host countries and created more than 300,000 local jobs. First, benefiting from the BRI, with the help of the Chinese government and enterprises, Tajikistan has achieved the unification of the national road network and the power grid. The road, tunnel, railway and natural gas pipeline projects undertaken by the Chinese side either successfully completed or rapidly pushing forward. The Dushanbe No.2 thermal power station aided by the Chinese government has met the needs of more than 700,000 residents in the capital Dushanbe and surrounding areas for winter power supply and heating. The bilateral trade volume between China and Tajikistan increased from 2.75 million U.S. dollars in 1992 to 1.5 billion U.S. dollars in 2018. At present, there are more than 400 Chinese-funded enterprises investing in Tajikistan, becoming the largest taxpayer in Tajikistan. China and Tajikistan signed a local currency swap agreement totaling 3 billion yuan. The RMB loan and trade settlement business of the two countries steadily advanced, and the AIIB actively supported the financing of the project within Tajikistan. Two sides are also exploring the possibility of establishing a joint investment fund. Second, benefiting from the BRI, Kazakhstan, the world's largest inland country, has found the Pacific Ocean estuary in Lianyungang Port of China. The logistics cooperation base built by China and Kazakhstan has become the platform of cross-border transport and warehousing logistics of many Central Asia countries. Third, on April 8th, the first new railway was opened to traffic after the independence of Sri Lanka in 1948. This is also the early harvest of the BRI in Sri Lanka. What kind of benefits can Afghanistan get from the BRI construction? This is the most concerned issue of all walks of life of Afghanistan. To put is simple, for Afghanistan, a landlocked country at the heart of the Eurasian continent, the BRI offers not only roads in all directions but also unprecedented attention and investment by the international community on its development. According to the latest research by international organizations such as the World Bank, the jointly building of the BRI will promote the global economic growth rate by at least 0.1%, cut the global trade cost and transportation time by 2.2% and 2.5%, and reduce the trade cost in the China-Central Asia-West Asia Economic Corridor adjacent to Afghanistan by 10.2%. From an economic point of view, Afghanistan's participation in the BRI can take advantage of its own geography, resources, demographic structure, connections and international attention, and avoid a lack of funds, industrial base and coastal ports. It gives Afghanistan the most convenient and cost-effective way to connect the world's emerging markets and the largest market, reduce the threshold and cost; It links Afghanistan's major cities, key enterprises to transportation lines which will form an agglomeration effect, from one point to the whole region, forming a platform for economic take-off; It will simultaneously stimulate Afghan investment, consumption and exports, simultaneously explore domestic and international markets, and strive to create jobs, and help Afghanistan get rid of the current passive situation that the 'three wagons pull the economics can't move forward and restrain each other. Afghanistan was among the first explicitly supported the BRI, signed the relevant memorandum of understanding and established relevant security cooperation mechanism with China. The Chinese side attaches importance to and appreciates the positive attitude of Afghan leaders, government departments and people from all walks of life and regards Afghanistan as an important partner in BRI and for early harvest. Afghanistan's active participation in the joint construction of the BRI has already and will continue benefit Afghanistan in six aspects, which can be summed up as six 'promoting. First, promoting trade. In just 4 months Afghanistan has exported more than 15 million US dollar pine nuts to China through 64 cargo flights after launching the program 'Charted cargo flight for Afghan pine nuts exporting to China in last November. Although the global trade declined last year, China-Afghanistan goods trade volume maintained the 1.1 billion US dollars, and Afghan carpets, marble and saffron are all selling very well in China. Second, promoting Chinese investment in Afghanistan. Although the security situation in Afghanistan is not good, China still invested some projects with nearly US $500 million accumulative investment in Afghanistan. Recently, a Chinese private company invested in Bamyan province to help the local people grow and sell saffron. Dozens of families benefited directly. Third, promoting education opportunities. Afghanistan is an important partner to China on the joint construction of BRI. To this end, China provides more than 150 scholarships and about 1000 training opportunities to Afghan every year, which is very helpful to youth and professionals in Afghanistan. Last year, protocol staff from the Palace and Mofa of Afghanistan were trained at the Diaoyutai State Guesthouse in China. Right this moment, a senior officials delegation of Afghan MOFA is visiting Henan province of China. Due to the BRI, the three-party cooperation related to Afghanistan is increasing, which is conducive to the complementary advantages of all parties and the cooperation of major powers in Afghanistan. China and India are discussing to provide training for the Afghan police officers. China and the United States are also discussing to help Afghanistan improve the education supervision system. Fourth, promoting the sense of security of the Afghan people. China's economic and trade cooperation with Afghanistan and all kinds of donation to Afghanistan have increased employment, helped Afghanistan in poverty alleviation, and are conducive to eradicating the social soil of terrorism and extremism. The security cooperation between China and Afghanistan under the BRI has also protected the people and struck the evils. Fifth, promoting Afghanistan's international visibility and cultural influence. 1300 years ago, Chinese great monk Xuanzang went to India for studying Buddhism through Afghanistan. He paid tribute to the giant Bamyan Buddha, and made the only authoritative record of the Buddha in the world. Nowadays, because of the BRI, the study of Gandhara civilization and the Bamyan Buddha has become a prominent school in China. Chinese archaeologists have come to Afghanistan, and Afghan treasures and scholars have also visited Dunhuang. Buddhist relics from Mes Aynak are expected to be exhibited on the Asian Civilization Exhibition which will be held at the same time as the BRI summit. Sixth, promoting Afghanistan's international access and diplomatic options, this is crucial for Afghanistan and other landlocked countries. The Chinese and our Afghan friends have both heard of the proverb: it takes two hands to clap. Early harvests in BRI will required concerted efforts from China and Afghanistan, including efforts by the Afghan side to give better play to the role of Afghan business people and chamber of commerce in China in promoting Afghan products and brands, supporting Chinese language programs and train more professional ‘matchmakers' for China-Afghanistan economic and trade cooperation. As a man sows, so he shall reap. So long as the Afghan side earnestly engages itself in the BRI, it will for sure happily benefit from it. While advancing the BRI, the Chinese side attaches equal importance, treats as equals and engages with equal enthusiasm to all participating countries. We are all members of the same band and every one of us is important and indispensable. Based on cost accounting, infrastructure conditions and trade practices, Afghanistan is currently promoting air cargo corridors, it is good, but can only be supplementary to land and sea transportation. The importance of Karachi Port to Afghanistan's foreign trade is unlikely to be reduced in the short term. Of course, the future of Gwadar Port is also an attractive choice. This is exactly the significance of the China-Pakistan Economic Corridor to Afghanistan. As we cannot choose our neighbors, good-neighborliness and friendship are invaluable. The Chinese side sincerely hopes that Afghanistan and Pakistan will increase mutual trust and improve relations. The trilateral Foreign Ministers' Dialogue successfully held in December last year expressed the desire to jointly advance the BRI, develop virtuous interactions between Afghanistan and Pakistan and promote connectivity between the two countries and others in the region. At present, the three government are studying the feasibility of enhance the connectivity of Afghanistan and Pakistan through railway and highway. Afghanistan is located between the China-Central Asia-West Asia economic corridor and China-Pakistan Economic Corridor (CPEC). If relations with neighbors in the north and south are improved and trade is better facilitated, Afghanistan's position in the BRI will be further consolidated, with its geographic comparative advantage and pivotal position on the regional value chain more prominent. If the security situation improved, the infrastructure upgraded, and the business environment improved, I believe that Afghanistan will attract more international investors including Chinese. The biggest challenge at the moment is security. There is a common proverb in China and Afghanistan, 'One flower does not make a spring, the BRI and regional economic cooperation is dedicated to make a spring full of the beauty of all flowers. Today it is the high-speed railway instead of the camels that lead the fast advancement of the BRI. In the words of Chairman Mao Zedong, 'ten thousand years are too long, seize the day, and seize the hour. It is hoped that together we will seize the current opportunity for peace and reconciliation in Afghanistan and jointly advance the BRI so that the Afghan people will bathe in the sunshine of peace and development at an early date!